Back in June 2014 I wrote how that in 2013, after visiting The Cyborg Foundation in Barcelona, I became interested in exploring sonification. My experients at that stage culminated in the production of the Pixel Waves Pure Data patch, which allows the sonification of images based on the colour/RGB values of individual ppixels. I spent the following months building and refining an update to the Pixel Waves software, with a focus on allowing multiple images to be played simultaneously. 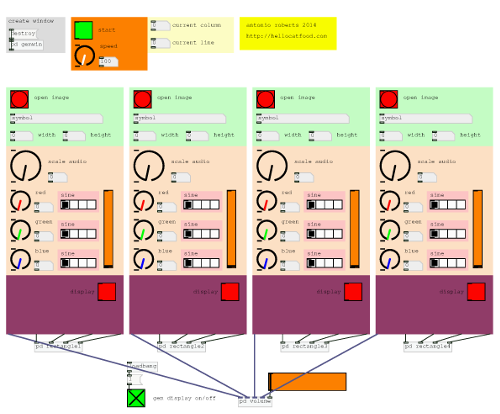 In a way, I wanted to create a sequencer but for images. After many months I’m happy to formally announce the release of the Pixel Player. The currently displayed/sonified pixel for each channel will be synchronised from the first channel. For this reason it is recommended that all of the input images used are the same dimensions. This may sound like a lot to do but it becomes easy after a few attempts. To make things easier the loadimage.pd patch has inlets that you can use to control each channel with a midi controller, keyboard, or any other device. To expose the inlets increase the canvas size of the patch by around 10 pixels. The software includes a video display output, which shows the current pixel colour. This can also be shown on the patch window by clicking the red display button. Flashing lights might not be to everyone’s taste, so this can be turned off. Due to this patch relying on [pix_data], the GEM window needs to be created, even if the pixel display isn’t used. Enough yapping, what does it actually sound like?! Here’s a small demo, made using a combination of 40×20 images made in Inkscape and images modified using the Combine script by James Allen Munsch (made for Archive Remix. Remember that project?). Please do give the patch a try and let me know what you think!